Wow I am using this sauna now a lot! Have a stuffy sinus and I use this for about ten minutes and everything clears - tho it’s not exactly why I bought it. Works well for steaming and opening pores before I exfoliate. My skin has never looked so good in my whole life likely. People are commenting how nice it looks, and some asking what am I doing as it looks so good. 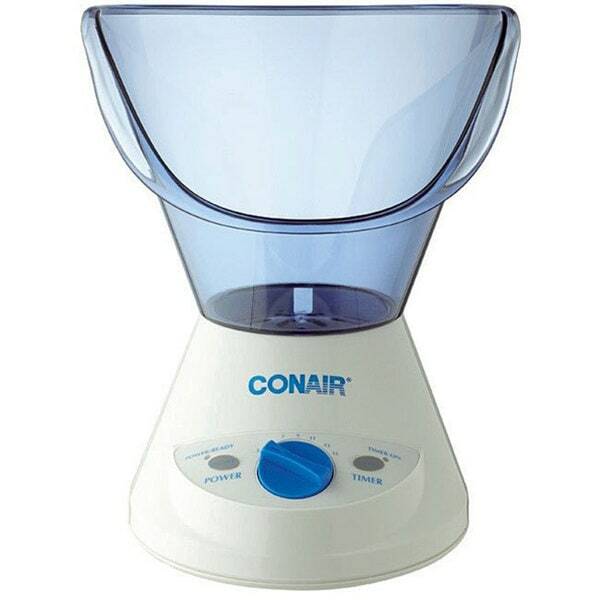 This facial sauna system by Conair features a convenient timer to customize the length of your treatment. This sauna system includes a gentle exfoliating brush and a sponge for applying moisturizer. It doesn't produce enough steam to really make a difference. I luv luv this face steamer. removes gunk in your pores. It works well but it does not release a lot of steam. It doesn't get too hot so it's actually quite comfortable to use. I supposed that's why it doesn't release a lot of steam. The water well is to small to get enough stream to do any thing with it. I sorry that I can't return back too overstock. disappointed . Its not a good buy I sorry that I can't give a 0.
recently used a similar one and it is perfect for seasonal allergies and general spa facial home care! Paying more attention to my skin as i am getting older now always wanted one!